When I started blogging I get really frustrated why other blog has their Most Popular Post widget in their sidebar, and I can’t do the same. Mostly all of the most popular widget on the internet posting like from BloggerBuster or BloggerTricks aren’t working for me. Maybe with you too? So I decided to dig down Yahoo Pipes where the scripting for this widget is done. So finally I make the widget working that you will see on my sidebar right now. I will now elaborate the steps and make a friendly tutorial for you, for those beginner and mid-blogger who is still wasn’t able to install this wonderful widget. I might say that this few steps are bit technical so I will make it simple with images for you to follow it well. The main thing about this post is cloning an existing “Pipes” of most popular widget so you can own it, I believe that other pipes that used several times would not work anymore –like what I’ve seen from other most popular widget with a single pipes account on it. So the solution make a copy of your own so other can’t used it and be optimized for your blog only. 1. Log on to your Yahoo account. The one you use for your mail and messenger. 2. After you log, go this link where you can find the Yahoo Pipes. 3. When you see the pipes, just click clone and it will automatically copy the pipes to your account. Now we just need to further customized it. 4. After you have cloned the pipes, we still need to copy one more pipes next click the “Edit Source” tab. 5. When the pipes appear, then scroll down then find the “Loop” function with [open] Blogger2… then click “open”. 6. After you clicked open, another set of pipes will appear and you need to save a copy of it. Save a copy by just clicking the “Save” button at the upper right of the Edit Source screen. 7. Navigate back to main pipes, you may do two things. Click “Back to My Pipes” or just by simply clicking the tab you will see at the upper section. Demoed below, click the image to enlarge. 8. Now let’s further customize the pipes, this the default url when the main pipes are not provided by your blog URL. 9. 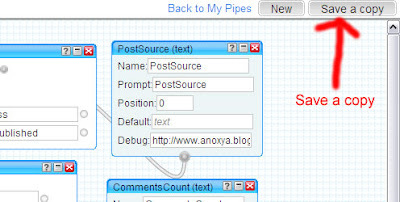 Test your widget if it’s working by clicking the “Pipe Output” on the bottom of the source pipes screen. a.) 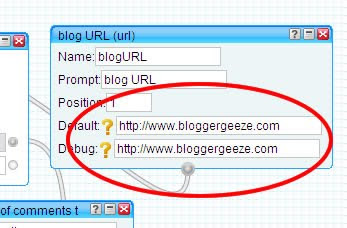 blog URL: Place your blog url in the field. 11. Then finally run the pipes, the “List” tab should show the most popular posts with the number of comments. Now we’re done on the Yahoo Pipes part, now here is the Blogger Part. 2. Go to Layout tab then add a HTML gadget. 4.) Replace http://yourblogurl.com with your blog URL. “numpost=10“, this will give 10 post to display you can alter it to number of posts you desire. Then the crucial part is the Yahoo Pipes id where you should replace it by the id you will find at the “Pipe Web Address” we clone back at step 3. Click the image to enlarge. Replace the green highlighted part of the code with your pipes id. 5. Now save the gadget and template. View it and the most popular widget should show on your blog. Finally we’re done, I believe you would find this really interesting and helpful. If you don’t mind I spend hours making this widget works and sharing it to others is I guess worth the thanks. Please let me know if you have any problem implementing this widget. Just drop it on the comment form. Credit to Techniqueal for the Pipes. Good solution and great tutorial. I have tried it and success. Thank for your explanation. I'm awaiting another tutorial for you. Bloggers will have the ability like wordpress with various tutorials submitted by you. thank you for this post.Is this widget for non-english blogs? is there any unicode or it is only for english language? From what I know, as long as you sit on Blogger platform you can implement this widget at any language, right now I haven't test it on own hosting or wordpress platform. Readers, Please do let us know if you have implemented this on your own hosting or wordpress? Thanks a lot for a bunch of good tips. I look forward to reading more on the topic in the future. Keep up the good work! This blog is going to be great resource. Great tips I was just researching how to do this and add my most popular posts to my Blogger sidebar so reading this was perfect timing. Great how to thanks I will bookmark it! i'd try for my blog popular post without number comment. great job. thanks. Fantastic! I am a professional writer from another generation. In recent years I have began “blogging” as a means to transferring my career from traditional writer and editor, to online journalism. I am working with a SEO organization and now find my lack of technical knowledge is limiting my own professional growth. With the support of our Director and article such as this I am finally beginning to comprehend the complexities that are associated with modern marketing and media. I ran the pipes, but the results did not look right. When I ran the pipes, it showed that my top post has 20 comments. But I know I have several posts with more than 20 comments each. I have been looking for this!!! Thanks to share this news with us, So finally I make the widget working that you will see on my sidebar right now. I will now elaborate the steps and make a friendly tutorial for you, for those beginner and mid-blogger who is still wasn’t able to install this wonderful widget. I am a professional writer from another generation. In recent years I have began “blogging” as a means to transferring my career from traditional writer and editor, to online journalism. I am working with a SEO organization and now find my lack of technical knowledge is limiting my own professional growth.